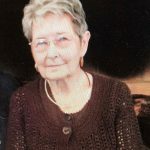 Virginia Louise Trice Millican, age 88, of Granbury, Texas, passed away Saturday January 26, 2019. She was born on June 1, 1930, to James and Mabel Trice. Graveside Service: 1:00 P.M., Sunday February 3, 2019, Hurst Cemetery in Star, Texas; Visitation: 5:00 – 7:00 PM, Saturday February 2, 2019, Martin’s Funeral Home, Granbury, Texas. Virginia was preceded in death by her husband: Bill Tom Millican; daughter: Rebecca Millican; parents: Mabel and James Trice; sister: Carol McSpadden. Virginia is survived by her daughter: Mary Millican; grandson: David Wixom; sisters: Mona Bennett, Shirley Burnett; and brother: James Trice. Be the first to share a memory of Virginia .